This basic definition comes from the Brundtland Commission and has become a very widely accepted definition for sustainability. 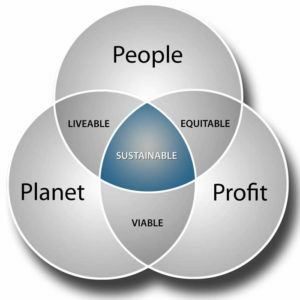 As depicted in the diagram below, this definition is based on three interrelated “pillars” that, when all are met, create a state of sustainability. Luurtsema Sales sees sustainability as a goal that will always be slightly out of reach. That is to say, what is considered sustainable today may not be in just a few years as our collective knowledge grows and new technologies develop. As a result we believe it is best to view sustainability as a path to be taken whereby we will always be questioning how we operate, which inputs are best to use, etc. Since 2009 through 2018 we recycle our bi-products plastic, paper, cardboard, metal etc… We are good neighbors and allow other area businesses to bring their recyclable materials to us. We have designed and built a washing machine to properly clean and reuse plastic products within our own industry. Chart to right shows our most recent results! In 2008 Luurtsema Sales implemented a beta version of its horticultural plastics recycling program. This program will be offered to all customers beginning the spring of 2009. In 2007 we introduced our line of USDA Certified Organic herbs and vegetables called “HARVEST IN HARMONY.”In 2019 our Organic Line continues in the Burpee Brand. Luurtsema Sales is continually searching for new inputs with the least impact on the environment possible. However, given the prevalence of “greenwashing,” it is not as simple as accepting the claims of manufacturers. Below is a list of questions we are asking as we evaluate new pots, soils, plants, etc.